These example sentences are selected automatically from various online news sources to reflect current usage of the word 'refinance.' Views expressed in the examples do not represent the opinion of Merriam-Webster or its editors. Send us feedback. Refinance refers to the replacement of a debt with new debt bearing different terms. Financing involves borrowing a specific amount of money over a length of time at an agreed-upon interest rate. Payments on the debt are divided between interest and principal. If circumstances change, for example, the length of time needed to repay the debt is longer and the lender agrees, the loan may be refinanced, extending the term and lowering the period payments (because they are extended over a longer period of time.) If interest rates change, the debt may be refinanced using a lower interest rate. 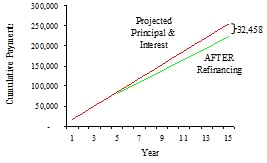 For example, the $150,000 loan below is shown with a term of 15 years at 8% per year. By year 5, the market interest rate drops to 5%. When the loan is refinanced over the balance of the term, for example, the savings in principal and interest payments on the loan will be over 32,000. Refinancing may also convert an adjustable rate mortgage to a fix rate mortgage, reducing the interest rate risk to the borrower. Refinancing may be restricted on debts containing "call provisions," requiring a penalty payment in the event of a refinancing. In addition, a refinancing usually requires a closing and transaction fee that may be expensive. As a result, it is important to calculate the present value (the value in today's dollars) of the savings and compare it to the closing costs of the refinancing. What made you want to look up refinance? Please tell us where you read or heard it (including the quote, if possible).